At my house we have a huge hillside that we've struggled to landscape for more than ten years. Luckily, we live on two acres, giving us plenty of other usable outdoor living space. If you don't have the luxury of extra yard space, here are two creative ideas for turning a hillside into a usable outdoor living area. Build an Elevated Deck into the HillsideThis deck makes excellent use of its hillside terrain. To get this look, hire a landscaping contractor to cut out a section of your hillside and build a concrete block retaining wall. Have a wooden deck installed and complete the space with comfortable teak furniture, a few ceramic garden stools, and an industrial style fire pit. When you're all done, you'll be able to relax and entertain in a space that used to be nothing but an unusable slope. Decking - For the strongest and most durable deck possible, use pre-stressed lumber or an exotic hardwood, such as ipe. Railing - You can find the steel cable railings through Atlantis Rail Systems. Garden stools - Pottery Barn sells ceramic stools in red, white or blue. Bargain tip: Recently, I've spotted similar ones at Marshall's and Home Goods for a third of the cost. Fire pit: The fire pit in the photo is custom made, but the Ore fire pit has a similar weathered industrial style. See how the steep hillside garden was transformed into terraces with concrete steps, concrete pavers, decomposed granite and great plants. 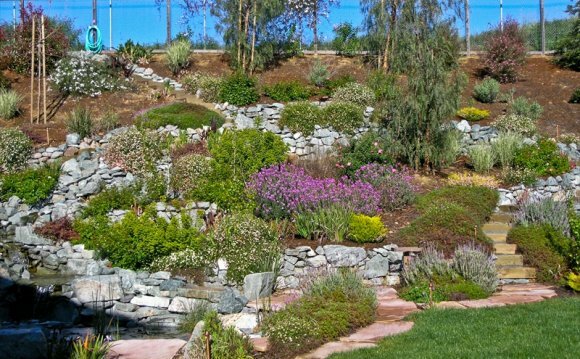 Create a Terraced Garden with Retaining WallsThis garden, named The Perfect Garden by its creator, employed free-form concrete retaining walls to create functional terrace spaces. To get this look, have a landscape contractor build a series of curved retaining walls with terraced patios, walkways and garden beds in between. When the project is complete, you'll be able to stroll through a lively garden on what used to be an unmanageable hillside. Walls - Install poured in place concrete retaining walls and add texture with a stamp. An Italian slate pattern was used on these walls. Railings - The iron railings in this garden are custom made, but a similar look can be achieved using wrought iron fencing or garden edging from your local home supply store. Plants - plant lush, colorful plants amongst the walls and terraces. Designate an area for growing edible plants.